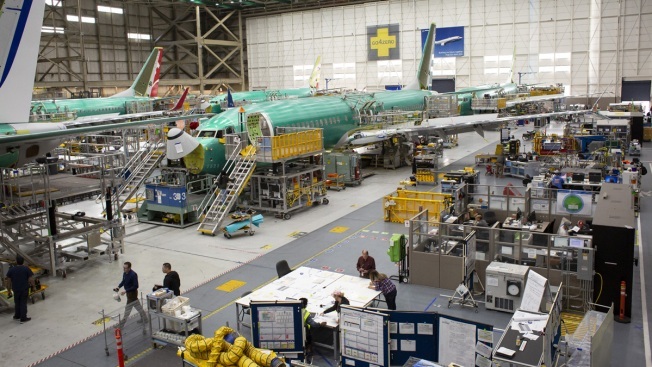 In this March 27, 2019, file photo, Boeing Co. 737 Max airplanes are seen at the company's manufacturing facility in Renton, Washington. Boeing Co. Chief Executive Officer Dennis Muilenburg apologized Thursday for the 346 lives lost in crashes of Boeing 737 MAX 8 aircraft in Indonesia and Ethiopia, according to a letter made public on the company's website. Boeing is cutting production of the 737 Max jets as the company moves quickly to finalize a fix that will get the grounded aircraft flying again. Boeing’s monthly production of the aircraft, involved in two plane crashes since October, is dropping by 20 percent from the current level of 52 a month to 42 a month, the company said Friday. "We’re adjusting the 737 production system temporarily to accommodate the pause in MAX deliveries, allowing us to prioritize additional resources to focus on software certification and returning the MAX to flight," Boeing Chairman and CEO Dennis Muilenburg said in a statement announcing the rate cut. Muilenburg said the aerospace giant is already working with suppliers to, "minimize operational disruption and financial impact of the production rate change." The production cut is likely to weigh on shares of Boeing which have held up relatively well after initially dropping more than 10% in mid-March following the crash of an Ethiopian Airlines 737 Max-8. It was the second crash of a 737 Max in the last six months and lead countries around the world to ground the airplane or ban it from flying in their airspace. Boeing’s shares were down 1.4 percent in after-market trading Friday. The FAA, after initially calling the plane "airworthy," joined the rest of the world on March 13 in grounding the Max. At the time, Boeing said it had no plans to cut production and many analysts agreed with the decision. Jose Caiado, airline analyst for Credit Suisse said in mid-March he expected Boeing to keep the assembly lines rolling at current levels so it didn’t disrupt supply chains. "They will just have to carry that inventory on their balance sheet a little while longer," he told CNBC. Boeing says it hopes to have a software fix for the 737 Max in the coming weeks that it will submit to the FAA and international regulators for approval. Their review and a potential certification could take several more weeks, even months, meaning the 737 Max could be grounded well into June, if not later. As a result, Boeing has decided it is smarter to roll fewer 737′s out of its plant in Renton, Washington. Separately, Muilenburg says the Boeing board of directors has formed a committee to "review our company-wide policies and processes for the design and development of the airplanes we build."